Redanne: Eileen Hull - Book Club Part 2 - and News! Eileen Hull - Book Club Part 2 - and News! You may remember that I shared one of Eileen Hull's latest Book Club dies HERE, well I am back today with another idea for using the latest Stamp and Photo Storage Box die. I just love how Eileen creates dies that can be used in so many different ways! 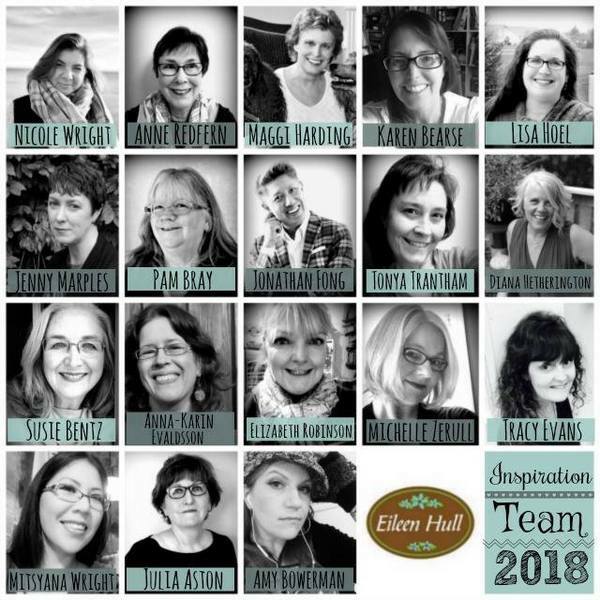 My first bit of exciting news is that I am on Eileen Hull's Inspiration Team again this year, I am so thrilled to be part of this amazing team! I have added a photo at the end if you are interested in seeing who else is part of the team. I created a Field Note and Map holder for someone who loves to walk in the countryside. Rather than bombard you with dozens of photos I have created a couple of collages to explain the process I used to bring this project together, with a brief explanation of the steps. I used the same method for the cover and the map holder inside. The covers were painted with various DecoArt paints, using a brayer. 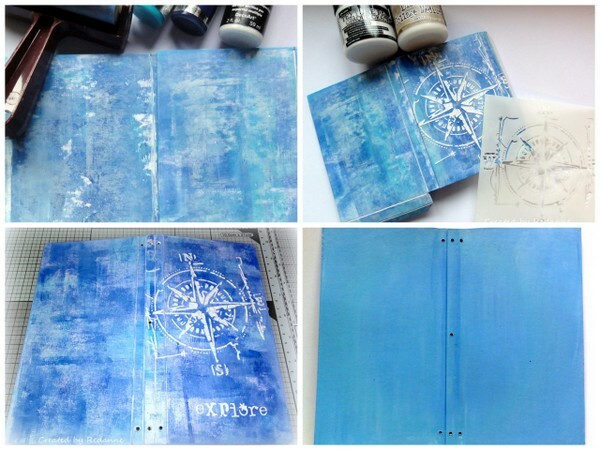 I used a fabulous stencil by AALL&Create to apply Ranger crackle texture paste to the cover and the map holder. I then applied two quite thick coats of Ranger Distress Collage Medium (matte) to all sides to give some water resistant protection. The inside of the cover was painted in plain blue. I created a single signature and a small pocket for the inside using Maja Design papers. To create the maps, I photocopied some favourite walks from a book, laminated them and added some cord so that they can be worn around the neck for ease of reference. To finish off I added a compass which is attached by a Tim Holtz Idea-ology clip. I always add a charm of some sort to my journals and this one is a TH Idea-ology Monocle with rub-ons that say 'best day ever'. I wasn't until I loaded up the photo that I saw that the monocle is showing the wrong side - oops! To finish off, I die cut the words 'Explore', 'Maps' and 'Field Notes' from plain white card, using the Tim Holtz Mixed Media #3 set of dies, I love the quirky font! In this photo you can also see the lovely textures that are created by using the brayer technique to apply the paint. All month long Eileen's Inspiration Team will be sharing lots of creations using Eileen's latest release of dies, HERE. If you do have the time I hope you will pop over to have a look! My second piece of exciting news is that I am attending Creativation (CHA) this year!! I am so very excited as I will get to see so many of my Crafty Heroes in real life!!! My travelling companion is none other than the uber talented Jenny (Buttons) - we are going to do our best to have a brilliant time and we will also be lobbying to try to get more of Eileen Hull's dies here in the UK. Wish us luck! Thanks so much for your visit, I really appreciate you taking the time. See you soon. Such a clever use of the journal die, Anne and such a well considered design that incorporates 'must haves' for any avid walker. So happy to see you on Eileens team this year ! Congratulations. Hope you have a fantastic time at Creativation . Enjoy every second . Take care and safe travel . 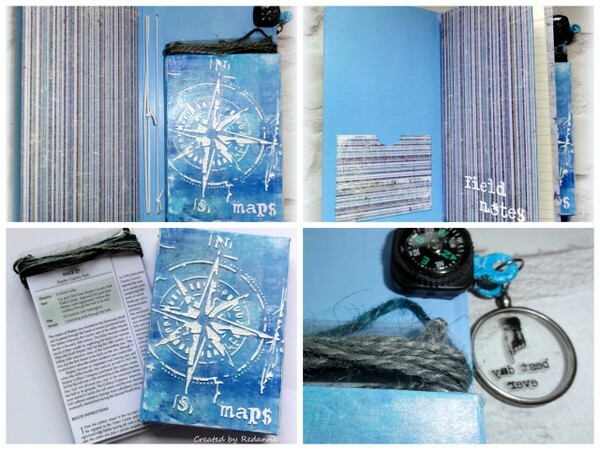 I love your idea of a Field Note and Map Holder, Anne! How brilliant to have this on hand when going on hikes .. so clever .. and so gorgeous!! Blue is my fave colour and this is stunning!! What a fabulous little journal. Congratulations on the DT post too .... how could she possibly let you go when you create such amazing projects. What a super make Anne. Congrats on your news - how fabulous and very well deserved. Congratulations on both bits of good news! And such a beautiful project! You have the best ideas Anne and the talent and expertise to make your ideas a reality! As I have said to you before, Eileen Hull is lucky to have you! Have a great time at Creativation with Jenny. Thank you in advance for trying to get Eileen's new dies to our shops. Coming from someone who likes to hike, I think this is not only a beautiful journal, but a useful one, too! The brayered covers and map holder (how clever a design!) are stunning, and your stencil work is immaculate (as always). Love the monocle charm! The laminated maps are a thoughtful addition. Congratulations on continuing your tenure on the Design Team; they are so fortunate to have you! Enjoy your journey, and have fun in Phoenix! Hugs! Have fun and make sure to take photos! Congrats on your being on the DT - they know talent when they see it! Congratulations Anne on another year to design with Eileen! I'm not surprised though, she'd be crazy not to invite you to renew!! This project is a perfect example of the amazing creativity to have when working with her die cuts. Such a fantastic design!! Big Congratulations on this wonderful CHA trip. What excitement and fun you will have! With your creative skills, you will enjoy seeing the new crafty goodness so much I think, dreaming of what you will create with what you see! This is such a lovely shade of distressed blue, perfect for the journal use you intended it for. Always enjoy seeing the photos & thanks for taking time to do this. Your 'eyes to see' just amaze me. Be safe, have fun, and enjoy to your heart's content! Big hugs, TFS (and Eileen's team is so lucky to have you as a member). Anne, I was popping over to say how lovely your book is but now I'm sad you'll be at CHA and I won't be there this year. I'm delighted you are going and I know you'll have a wonderful time... just sorry to miss you! So glad we got meet last year in the UK! I know you'll have an amazing experience with Jenny - wishing you both every success! What a glorious bluesy journal, Anne. The white texture is so fabulous against the ocean depths. Huge congratulations on your continuing EH design work - there's no way she'd let you go! !